I certainly have developed a newfound respect for cornstarch. It usually hangs out way in the back of that cabinet that houses the baking powder and various exotic spices rarely used – until today that is. Sure, most of us already know it can be used to thicken soups, sauces and stew. But used alone to bread shrimp? This super neutral ingredient is perfect for almost anything! Certainly shrimp! But you also could use it for fish, chicken or vegetables. I used a light dusting of cornstarch along with a few dry spices to create this Crispy Shrimp today. 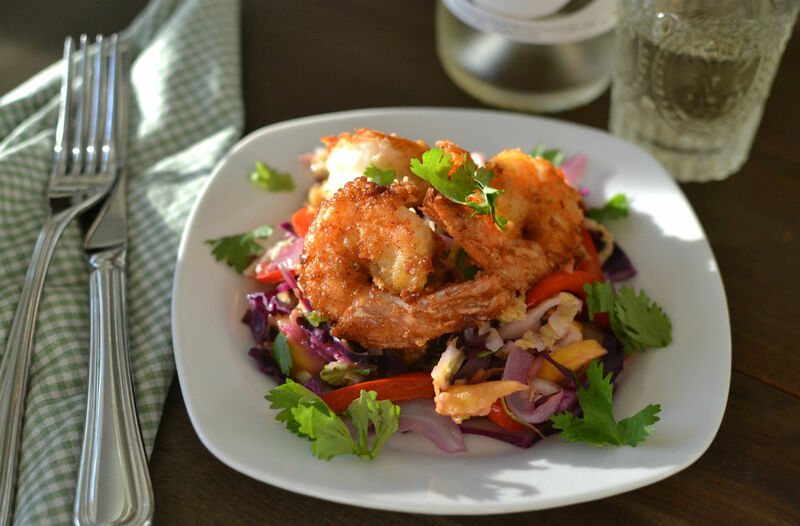 Perched upon a warm Asian Coleslaw and dinner was ready in less than 20 minutes. Now that is a winner of a recipe in my book honey. In a large skillet or wok heat up the sesame oil, when heated through add the onion and red pepper. Cook stirring every now and then for about 3-4 minutes, or until onion starting to soften up a bit. Add the cabbages and jalapeno now and mix well while cooking over medium heat for a few more minutes. Now add the garlic and fresh ginger, give it a another minute or so. Remove from heat and squeeze lime all over, then add mango, cilantro and scallions. In the meantime place the shrimp in a large bowl, sprinkle with kosher salt and let sit 5 minutes. Add cornstarch and spices to a large sealable bag, pop in the shrimp and shake around so they are all coated with the mixture. Heat the oil over medium high heat, add the shrimp and cook undistubed for 3-4 mins per side or until nicely browned then flip and cook the other side until nice and crispy. Remove from pan and serve with warm coleslaw.